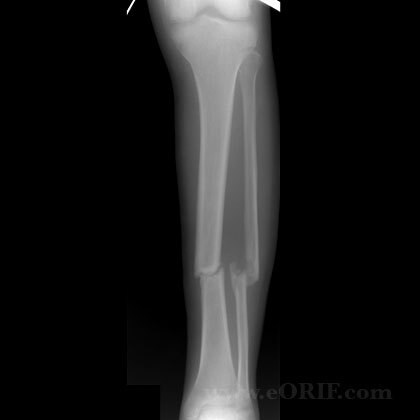 There is no generally accepted definition of a tibial shaft nonunion. No radiographic evidence of progress toward healing for 3 consecutive months. 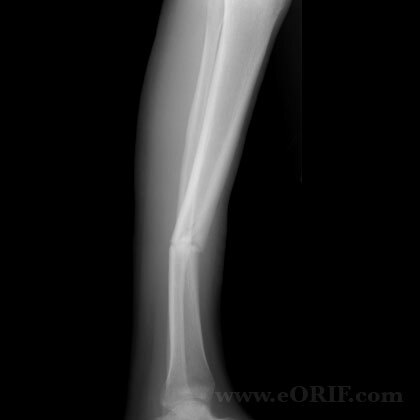 Nonsurgically treated fractures with gross clinical motion >1 month after injury. Radius of supramalleolar curvature is approximately 20cm, ie medial surface turns medially @25degrees. Diaphyseal blood supply is via a single nutrient artery, the proximal branch of the posterior tibial artery which passes through the most proximal portion of the tibialis posterior to obliquely enter the tibial shaft on its posterior surface in the proximal portion of the middle third of the bone. Only peripheral 1/3-1/4 of diaphyseal cortex is supplied by periosteal vessels. Fibula bears 6-17% of body weight, fibular head is attachment for LCL and biceps femoris, common peroneal nerve wraps around fibular neck. Rule out infection before treatment. See infection work-up. Consider intraoperative gramstian and cultures. Nonunion after IM Nail: Consider nail dynamization. 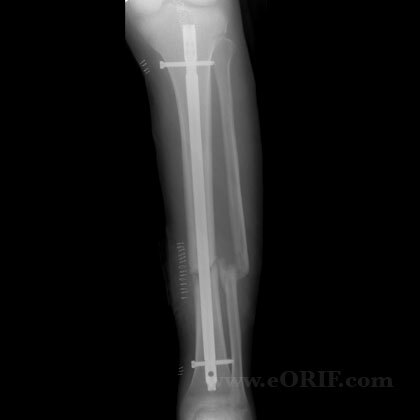 Nonunion after External Fixation: ORIF with ICBG or IM Nail. 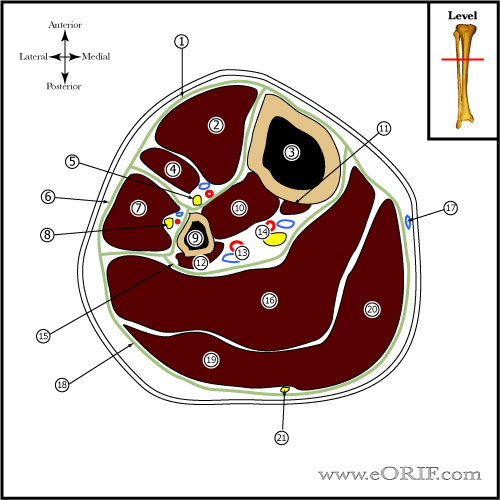 ORIF shows best outcomes (Wiss DA, JBJS 1992;74A:1279). Nonuion after cast treatment: reamed IM nail. Hypertrophic: revision with reaming to large diameter IM nail. Atrophic : reamed IM nail with or without ICBG, consider percutaneous injection of bone marrow aspirate (Hernigjou P, JBJS 2005;87A:1430). Large Osseous defects: see Bone graft options. rhBMP-2 (Infuse-Metronic) has shown clinical utility in spinal fusion (Glassman SD, Spine 2005;30:1694) and tibial fractures (Swiontkowski MF, JBJS 2006;88A:1258). BMP-7 (OP-1-Stryker): has shown clinical utlity in spinal fusion (Vaccaro AR, Spine 2005;30:2709) and tibial nonunions (Friedlaender AR, JBJS 2001;83A(suppl 1):s151). Knee pain(IM nail)40-56% (Court-Brown CM, JOT 1997;11:103), (Keating JF, JOT 1997;11:10). 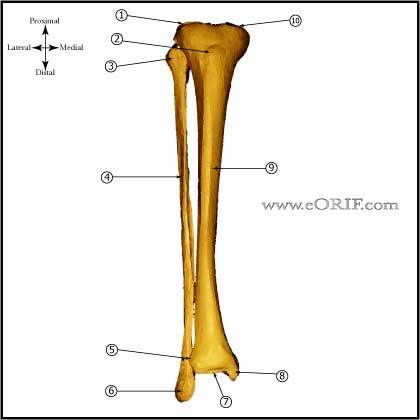 Goulet JA, Templeman D: Delayed union and nonunion of tibial shaft fractures, in Springfield D (ed): Instructional Course Lectures 46. Rosemont, IL, American Academy of Orthopaedic Surgeons, 1997, pp 281-291. 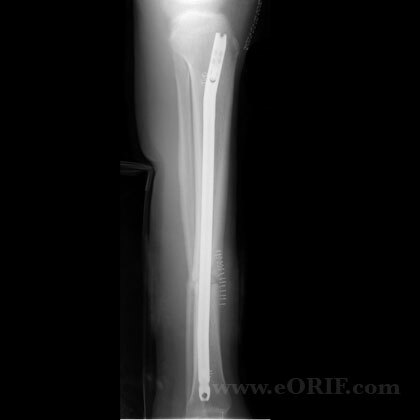 Carpenter CA, Jupiter JB: Blade plate reconstruction of metaphyseal nonunion of the tibia. Clin Orthop 1996;332:23-28. Lonner JH, Siliski JM, Jupiter JB, Lhowe DW: Posttraumatic nonunion of the proximal tibial metaphysis. Am J Orthop 1999;28:523-528. Stevenson S: Enhancement of fracture healing with autogenous and allogeneic bone grafts. Clin Orthop 1998;355:S239-S246.